This book was amazing. I love the story. A great first book to a series that I can’t wait to read. As the main character in the book said this is like an American Harry Potter story without the wand. This book is full of magic and mystery, an angry beast and strange neighbors with magical “fireflies”. I highly recommend this book. It was great. The author writes so wonderfully painting each scene that makes you feel like you are there. 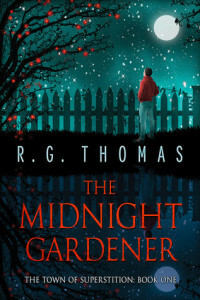 If you like YA m/m stories with magic and mystery that includes quests then this is a book you will love. R. G. Thomas has been reading books from an early age. As a young gay man, however, he found very few characters with whom he could truly identify. Now that he’s an adult—or at least older than he used to be—he likes to write stories that revolve around gay characters. The Town of Superstition is his YA fantasy gay romance series which includes wizards, witches, and other magical creatures. When he’s not writing, R. G. Thomas loves to read, go to movies, watch some TV, and putter around in the small suburban patch of ground he calls a yard. He visits his mother once a week, not just for the free cookies, and enjoys spending time with close friends drinking wine and making up ridiculous things that sometimes show up in his books. Although he hates the process of travel, he does enjoy experiencing new places. His dream trip is to one day visit the country of Greece, and he is currently saving his nickels and dimes to make that a reality.